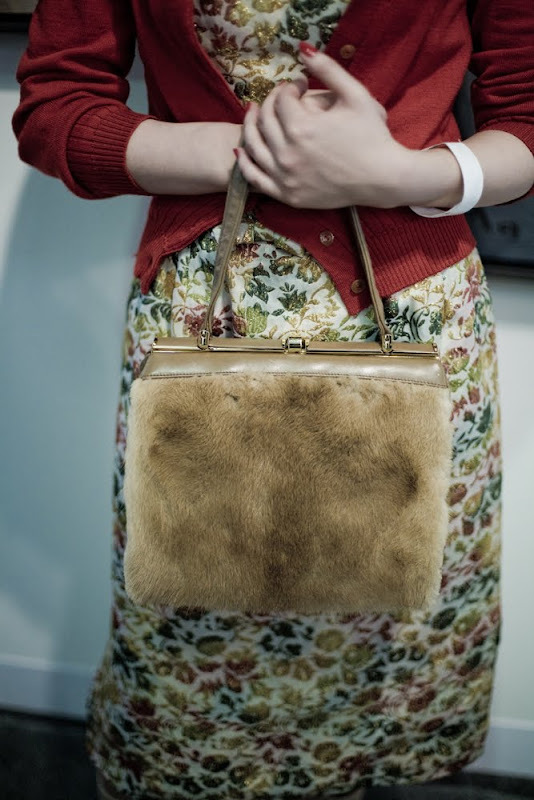 Dress: 1950’s Vintage; Purse: Vintage bought on eBay; Shoes: Louis Vuitton ; Sweater: Vivienne Westwood. So for my sake, all of you, take just a few moments to experience the first picture here. I won’t say more. But do tell me what you think. So now that you’ve established that S is a genius and when it comes to spotting incredibly fashionable people we’ve had really good luck so far, I have another thought in my head. Not that I don’t like current fashion as we wear it right now, but I often wonder why I am always gravitated towards the classics. I mean every decade before, I would say, 1980’s was different [fashion wise]. Each had its own style and almost its own era. From 1980’s onwards I feel like everything has just been a mismatch and blur of generic trends and returning trends. IMHO we don’t have a strong style type that truly belongs to our decade, namely 2000-2010. Or should I wait till 2040 to look back and maybe it will be more evident then? Not sure. 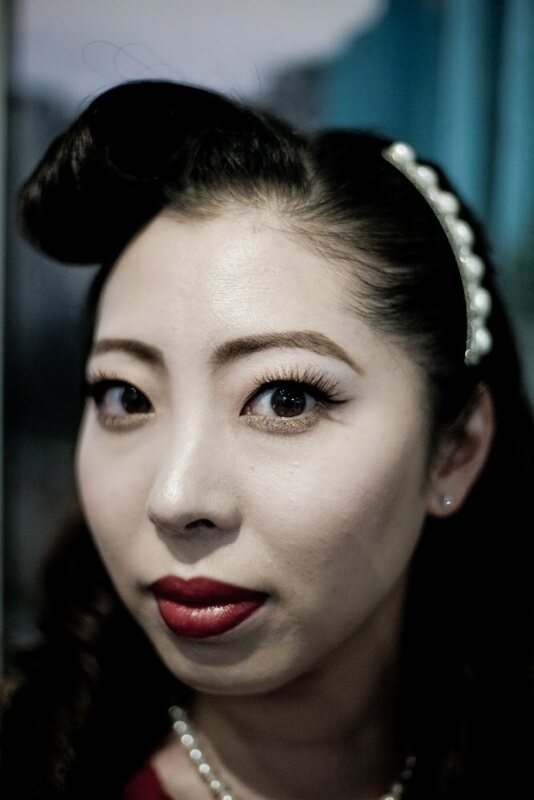 Maki is a Fashion consultant and designer clad in 1950’s vintage. Taking the whole look from head to toe in that direction. The hairstyle, the pearl hair pin, the purse, the makeup, everything!! Its so exciting for me to meet such people. I loveeeee it!! Just stunning! Her booties and dress are my fav! Reallllly fab pictures! Very old world chic :) Her sunnies are to die for!! Louis Vuitton vintage boots..? Soo cool! gorgeous gorgeous gorgeous! my favorite is the 1st pic! it's like time travelling! Excellent combination for her outfit. Love the hair, not to mention the vintage stuff! send S to Bombay. I lover her work, they are fabulous! Ah! 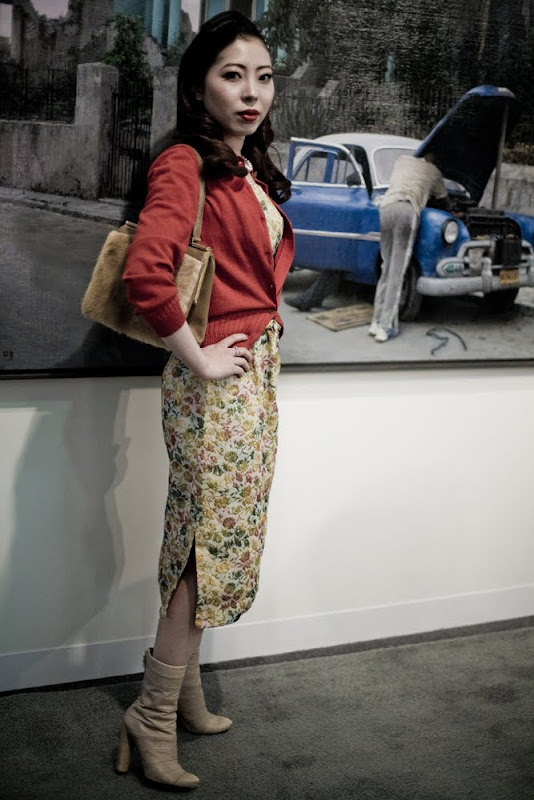 I loved the little surprise when i saw you were standing in front of a painting and not on the street! This look is so FABULOUS! I am just dying over the bag!